A visit to Bailey’s studio. A treasure! A box of Polaroids from 1974. When visiting an artist as versatile as Bailey, one should always expect the unexpected. 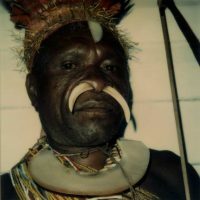 Despite this, it was a great surprise to discover a box of Polaroids taken in Papua New Guinea in 1974, fascinating for their subject matter as well as for their artistic merit. What followed was a happy-dance and a handshake confirming the opening of “Papua Polaroids” on October 4th. In 1974 David Bailey visited the New Guinea wilderness and pointed his Polaroid camera at the bow and arrow carrying people, resulting in photographic portraits that have been hidden from view in his archive ever since. Today indigenous peoples are gazed at and possibly even envied by us for the seemingly simpler and more understandable world they inhabit. The nostalgic aura of Polaroid film intensifies this sense of longing for a more natural and primal way of life. Daniel has long been interested in Oceanic Art. It is therefore a particular pleasure to find this interest mirrored in Bailey’s work of the 70s.